First Series: TvP between sSak and Sky. We've seen some strong play from Sky this entire starleague. Taking out Hiya 2-0 in a convincing series, Sky showed that he can be patient and calculating. On the other hand, sSak has also been doing well lately though his recent results aside from a 2-0 win in RO32 over the Protoss Changers have been against Zerg players such as hero and Killer. These two have faced each other in the past. Back in the first season of 41 Starleague, Sky ended up eliminating sSak in RO32 in the finals match with a 2-1 win. The other time they've faced each other was in Gabangpop 1st Sonic PL where Sky also beat sSak on Circuit Breaker. Based on their past history and Sky's recent form, this will be hard series to call. Prediction: Sky will take it in a close 3-2 series with a high forecast for cheese on HBR. Second Series: TvZ between Cola and Mind. Cola and Mind have only faced each other once before, in Gabangpop 1st Sonic PL where Cola lost to Mind on New Sniper Ridge. Their respective records speak for themselves as well. Mind's vZ is sitting at a high 78% though that only takes into account 18 games. Cola vT is sitting at a dismal 39% and he's been on a 14 game losing streak (prior to recent results) which doesn't bode well for him. We should keep in mind that Cola did defeat Sea however one game isn't any indication that his vT is enough to dispatch Mind. Also, Sea's failed 8 rax bunker rush contributed to his win. Mind on the other hand has shown some solid vZ games against the likes of ZerO even if that is ZerO's weakest matchup. He has lost to larva 2-0 in RO32 but one loss doesn't override his whole record. Unless Cola can re-invent himself and study Mind's play to come up with good strategies, he doesn't stand a chance to advance to RO8. Prediction: Mind should take this series 3-0. First Series: ZvZ between HoGiL and Killer. HoGiL looks like the dark horse of this tourney. He wasn't around to play season one of 41 Starleague and his post-Kespa era BW record only contains several games but his vP and vT games seem solid from what we've seen so far. However, he's only played two games against Zergs and both were in Gabangpop 1st Sonic PL. He beat beast whose ZvZ is average but lost to Killer on Mist. Taking a look at his professional BW record, his ZvZ was sitting at 31% with his last win before retirement against Jaedong to knock him out of Bacchus OSL. His opponent, Killer is the undisputed best Zerg in the current BW scene. Killer is coming off beating hero 2-0 convincingly in the RO16 and beating ZerO 2-1 in RO32. His current ZvZ record is 76% which is insane. When considering everything, it's safe to say that Killer will take this series easily. Prediction: Killer will take this 3-1. Even Killer can still lose a game. Second Series: TvP between Sea and Shuttle. Both players have clashed several times before. In Gabangpop 1st Sonic PL, Sea beat Shuttle on Neo Electric Circuit. In 1st LoveTV BJ Starleague, Sea has also won beaten Shuttle 2-1 on his way to first place. Recently, in BCTV Starleague Season 1, Sea beat Shuttle 3-0. This puts things in Sea's favour. On top of that, he's beaten Snow, GuemChi and Lazy this season to make RO8. On the other hand, Shuttle has strong vP and has a higher winrate against Terrans than Sea has against Protoss. 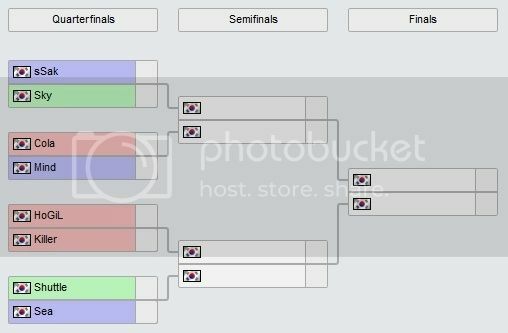 Shuttle has also beaten Mind this season otherwise most of his recent victories have been against other protoss and zerg players. Though historically, TvP has been Sea's worst matchup, his recent results against Shuttle indicate that Sea has a good fighting chance and has a high chance of taking this. Prediction: Close series, 3-2 in Sea's favour because I'm bias towards Sea! Hopefully, everyone can tune in to watch some exciting RO8 matches! Thanks to Stratos for posting up the groups and dates. Shuttle wins you heard it here first. Why isn't this under Community News yet, ffs? I hope we get a Killer vs Sea semifinals. I remember some of those SRTs where their games were so wacky and funny to watch. Sea also seems to have Killer's number lol. If it was Snow instead of Shuttle, Sea would've had no chance. I dunno about that. Sea did take a win against Snow in RO32 to take him down to the loser's match so who's to say that he can't just win against him 2 more games if bo5. Shuttle vs Sea should be sick! Hoping for 3-1 from Sea!! Wouldn't be surprised to see Sea take it 3-0 even though Shuttle is not to be underestimated imo. I think he'll make it a series and a rough one at that. I really appreciate your coverage of this league! Keep it up! Glad you guys enjoyed it. Sea fighting! Hogil is day9's ultimate favorite...Hogil has the favor of a god he cannot lose!